Project Management Tools on MPMM.com. Project Management Tools: As a project manager, consultant or trainer you can use this tool kit to manage projects on time and within budget. Managing a project can be a challenge. But by using these Project Management Tools, you can deliver your projects on time and within budget. The MPMM project management tools give you all of the processes, templates and practical examples you need, to work smart. They save you time and effort, as you never have to start from scratch. Simply use the templates and examples included to get a head start. 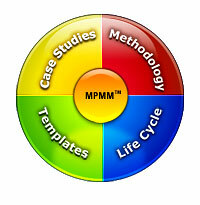 MPMMTM offers you an entire Project Management Life Cycle at your fingertips. Every phase, activity and task within the project life cycle is described in depth, by explaining how it should be undertaken, who should complete it and when. By using the knowledge gained from this project management life cycle, you will be able to Initiate, Plan, Execute and Close projects more efficiently than ever before. 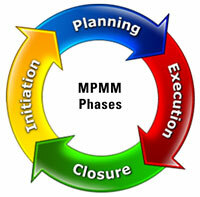 In addition to offering an entire methodology and a suite of templates, MPMM provides a full suite of examples to give you real, practice examples of project delivery. Every activity in the Project Life Cycle has a comprehensive project management example to help you. These project management tools help you to implement projects faster and more easily than before. To immediately download the complete project management tool kit for managers and teams, click the "Free Trial" button below. You will receive an entire methodology for managing projects, as well as all of the templates and practical examples needed to ensure project success. "MPMM is great. It's easy to use and the project management tools help you complete each stage of the project life cycle quickly."